This week I am lucky to have guest blog by the lovely Alana Scott from A little Bit Yummy. Alana combines her passion for cooking with her love of writing to bring us science based information and yummy low FODMAP recipes. Read on for her 6 secrets to great low FODMAP cooking. 1. Recapture onion and garlic flavours. ​Onions and garlic might be off the menu, but you don’t need to miss out on their flavours. Garlic or onion infused oil is a fantastic way to safely replace onion and garlic in meals. The fructans in the onion or garlic cannot leach into the oil, which means you get the flavour without the FODMAPs. These oils have a strong flavour when you add them raw (so start by adding a drizzle) and lose some of their flavour when they are cooked for long periods of time (you might need to add more). You can also use chives, the green tips of spring onions or green leek leaves to recapture onion flavour. I use about 1 cup of finely chopped green leek leaves to replace a small onion. Don’t waste the bulb… even though we can’t eat the white bulb of the spring onion or leek we can still use it in the kitchen. Place it in a glass of water after you have harvested the green tips, then leave it on a window sill for a few days. The green leaves will reshoot! 2. Get creative and explore new herbs & spices. Pretty much all herbs and spices are low FODMAP so they are the perfect way to pack some flavour into your meals! I love working with cumin, paprika, ground coriander and dried chilli flakes in spice based meals, and basil, oregano, and thyme in more savoury meals like my low FODMAP spaghetti bolognese. When it comes to herb and spice combinations the possibilities are endless. Just steer clear of premade spice mixes (unless they are certified FODMAP Friendly or contain low FODMAP ingredients) as they are often made with onion or garlic powder. 3. Don’t skimp on the salt! It’s an amazing flavour enhancer. Wait what? You might be sitting there thinking that salt is ‘bad’ for you and you’re right – large amounts of salt can have a negative impact on your health. However, the low FODMAP diet encourages you to eat more whole foods and less processed foods (these tend to have higher salt levels), lowering your overall salt intake. This means you can safely season your home cooking with salt to bring out the flavour. 4. Create a good base. Instead of just adding water to bulk out the liquid content of your meal consider using low FODMAP stock or a splash of white or red wine. These ingredients help to deepen the flavours within your meals. There are also some great ready-made low FODMAP sauces, like the FODMAPPED For You range, that you can use as a base for your meals. 5. Balance flavours with sugar and spice. We all have different taste preferences so it’s important to remember that a recipe is just a guide. Feel free to tweak the recipe slightly. If it’s too tart or sour try adding a pinch of sugar or a drizzle of maple syrup. Not spicy enough? Try adding chilli flakes, a small pinch of cayenne pepper, or a dash of tabasco sauce (just check for sneaky onion or garlic in the ingredient list first). Not tart enough or need to enhance the flavour? Try adding a couple of drops of vinegar or a squeeze of lemon juice (this is my favourite way to bring out the flavour in slow cooked meals). 6. Keep some homemade dressings in the fridge! If you are in a rush, low FODMAP condiments can be your savior when creating a quick & tasty meal. My go-to sauces at the moment are my low FODMAP BBQ sauce (perfect for low FODMAP burgers or meatballs) and my maple mustard dressing which is lovely with chicken or on salad. My maple mustard dressing recipe is: ¼ cup mayonnaise*, 2 tablespoons pure maple syrup, 3 tablespoons Dijon mustard*, 1 tablespoon white vinegar, small pinch cayenne pepper*. Mix ingredients together until smooth and store in the fridge. 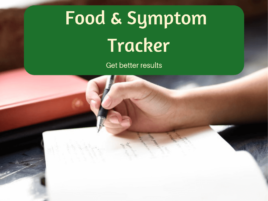 *Check ingredients for sneaky FODMAPs. 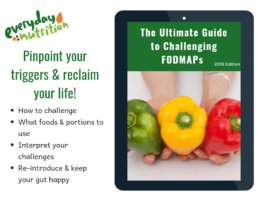 There is no need to endure boring meals while on the low FODMAP diet. If you need more cooking tips or delicious low FODMAP recipes make sure you head on over to alittlebityummy.com. I even offer low FODMAP meal plans to help take the stress out of the low FODMAP diet. Photo Credit: ‘Herbs & Spices On Wooden Board’ by Dionisvera licensed under Shutterstock Standard Image. Edited by Alana Scott from A Little Bit Yummy.